Using normal soffit vents or DCI’s revolutionary SmartVent system, cooler air enters the attic at the soffit level and is drawn up and out of the SmartVent vent acting as an exhaust. SmartVent’s single side venting creates excellent “negative air pressure” causing hot attic air to be literally pulled out of the structure that has a dormer peak. 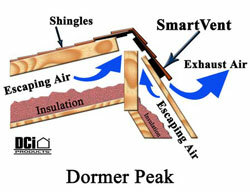 Use it on low slope dormer roofs with rubber or rolled roofing applied over the vent to seal. SmartVent is an under shingle vent designed for installation as an intake or exhaust vent. Ideally a structure should have a balanced flow between intake and exhaust area, but when the structural design design not permit, SmartVent can be used to provide consistent airflow while keeping a near invisible appearence the ground level. Because of the one sided design, unsightly ridge lift is eliminated from the street side of the house. This results in perfectly clean roof lines instead of the sloppy shingle lift most ridge vents leave behind. SmartVent is a tapered, under shingle plastic product designed for installation along the soffit edge of the roof or the facing edge of dormer rakes and goes virtually unnoticed. It allows air to flow freely through the 1″ roof decking slit providing more than adequate soffit ventilation to maximize ridge vent effectiveness. This is extremely important since most ridge vent products require an equal amount of ventilation at the soffit in order to work properly. SmartVent, when used at both soffits, has a total NFA rating of 18 sq. in. per foot(or 9 sq. in. on each side of a standard gable roof). Most houses with ridge vents do not have the proper soffit ventilation required because attic insulation blocks the soffit vents. SmartVent allows cooler air to enter under the shingle, through the 1″ roof slit and out the ridge vent providing superior air flow and attic cooling. Click here for an expanding list of SmartVent Dealers. If no dealer is located near you please give us a call at 1-800-622-4455 and we will be happy to locate a dealer for you.